Fesher delivers first batch of ARJ21 interior furnishings to COMAC__Commercial Aircraft Corporation of China, Ltd. 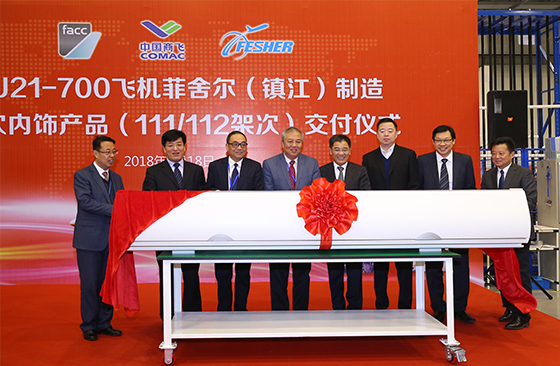 The first batch of 147 interior furnishings produced by Fesher Aviation Components (Zhenjiang) Company Ltd. for two ARJ21-700 aircraft was officially delivered to Commercial Aircraft Corporation of China, Ltd. (COMAC) on January 18th, 2018. Mr Zhang Yefei, Mayor of Zhenjiang, and Mr. Wu Guanghui, Vice President of COMAC, attended the delivery ceremony. Mr. Wu Guanghui expressed thanks to Zhenjiang municipal government and relevant enterprises for their long-term support and help to COMAC. He pointed out that the successful delivery of this batch of interior furnishings indicated that Fesher had become the first domestic enterprise capable of producing the complete set of civil aircraft interior furnishings, and explored a feasible development model and road for the localization of Chinese civil aviation industry chain. He hoped that Fesher could continue to provide strong guarantee for the acceleration of batch production of ARJ21 program and the flight test and certification of C919 program. Fesher Aviation Components (Zhenjiang) Company Ltd. is a joint venture company invested by Hong Kong Future Aviation International Investment Co., Ltd, AVIC Xi'an Aircraft (Zhenjiang) Aviation Technology Development Co., Ltd and Zhenjiang New District High-Tech Industrial Investment Co., Ltd. Fesher is supported by the core technology of Future Advanced Composite Components (FACC) merged by Aviation Industry Corporation of China (AVIC), has introduced and absorbed the advanced experience of FACC in program management and technology management, and has built the first domestic professional production line with the goal of constructing important composite structures and interior furnishings for international and domestic large civil aircraft. 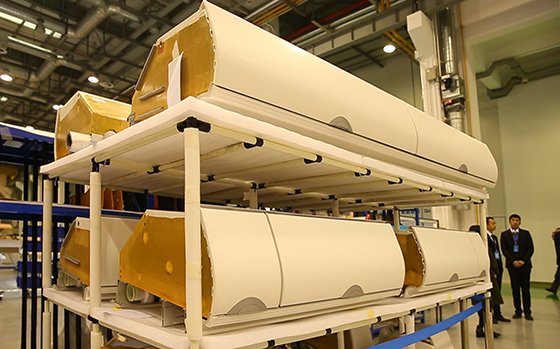 The production of this batch of ARJ21 interior furnishings is the first interior furnishing program of Fesher and has been launched at the beginning of 2015. A photo of part of the interior furnishings delivered this time.